Jim Hunter was born and grew up in Co Durham and first attended art school at the then Teesside College of Art. He studied painting at Winchester School of Art from1970-73, with William Crozier as Head of Fine Art and John Bellany an influential tutor, and graduated from the Royal College of Art in 1976. In many ways the most significant period of study for him was the time he spent in a studio in the Cite des Arts, Paris: from this period grew his enduring interest in modernism and the potential of abstraction. In his paintings he has always used places as the starting point for developing his imagery: from a student drawn to the North Pennines and Cornwall to those special places in his later life that include the Isle of Purbeck and Italy. 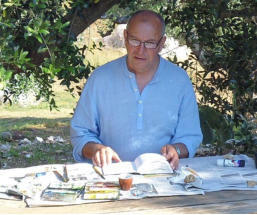 In 2005 he enjoyed a sabbatical period in Venice and his large works on paper using water-based media and collage are a direct consequence of this experience Jim Hunter has pursued his practice as a painter alongside his career in art education, until recently as Deputy Vice-Chancellor of the Arts University Bournemouth and, since 2013, Professor Emeritus of Painting. Jim Hunter lives in Purbeck, Dorset. In 2017 Jim Hunter was the winner of the prestigious David Gluck Memorial Award at the Contemporary Watercolour Competition and, in 2018, he was elected a full member of the Royal Watercolour Society, RWS.